After my novel draft failed at the box office, I sat with my feet up – or my foot up, as I was recovering from bone spur surgery – and thought about my options. Soon enough my mind lit on a subject like a bee on a coneflower: the life of Fanny Trollope, whom I’d always admired for her intrepitude and forthrightness. I had first read Fanny’s book Domestic Manners of the Americans in college. It was an instant bestseller in 1832, now mostly forgotten. Trollope set out from England, middle-aged, broke, in search of riches through a harebrained scheme of building a department store in Cincinnati. Her colossal failure set the stage for her trek through Jacksonian America (three children in tow), where she chronicled everything she saw through the lens of domestic life. Domestic Manners was devoured by American and English readers alike. Fanny got rich. People didn’t always find her likeable, but that was because she was so bracingly smart in her commentary. 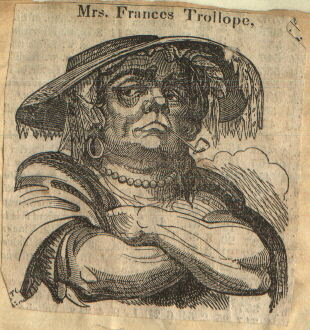 I wanted to write a book that would bring Trollope to the fore, to show her incredible spirit to the world. And I think I secretly wanted to emulate her. So glad you are blogging again! I’ve missed it.